For my avid readers, the fact I have maintained a clear head through the years that I have been a Targetted Individual fighting this war with a pen must be very evident. It is in fact not just the mind that I have managed to preserve using the methods I have learned along the way, but all the other major organs as well. Apart from my face that I never protect because I harbour an unrealistic fear society will consider me to have one or other challenge, that nornally only looks proper when I emerge from the faraday cage in the morning, but gets into a state after exposure to microwave and ultrasonic bombarment due largely to the fact it is closest to the brain, the organ prioritised in directed energy attacks, the rest of my body does not deviate as much from the norm. I have the shields I constantly wear, and others I sleep within, to thank for my good mental and physical state. I also have the fact I learned of what works and what does not to thank for avoiding taking the bad advice about shielding that is out there. I am as sure as it gets that it is the shields that have preserved my body and soul because of first hand experience of the effects and also because I can always test the knowledge. Whenever I go out without the shields, whenever I sleep without them, I get assailed like my perps are trying to make up for lost opportunity. Afterwards, I find myself in a state, nursing subdermal injuries all over my body, linear pains in regions leading to major organs such as the heart, the brains, kidneys, and some more. Whenever I get exposed to harm, I ensure I eat as well as my budget allows, then dodge behind the cover of my better shields, allowing my body to repair the damage before venturing out again. How well this works, how fast the repair is done tells me how good that particular shield is. Shields are absolutely vital to a target's mental and physical health. It does not matter how flimsy they are, and in some instances whether they are grounded or not. It is better to surround yourself with some shielding rather than be completely without, especially during the most vulnerable period of sleep, when you are not mobile. This is the time when perps attack the most knowing all is layed out. They can isolate individual organs, take aim and time causing the damage that will lead to incapacitation or death. The best shields cost money and will be beyond your reach if you are a priority target. Your perps will have strict instructions to foil anything that could lead you to funds. I am a good example of a TI who is being prevented from getting the money or other items that could eventually gain me the funds that I can use to change how I fare under the circumstances, and also a good example of the difference that flimsy shields make to the survival prospects of a targeted individual. Let me cut to the chase by listing below the things you should know about shields, the conventional advice you should ignore and why, and the shields you are advised to use when out and about. You cannot live forever in a faraday cage, or any other kind of protected space, after all. Faraday Cage The cheapest and, for some lifestyles, most readily available materials for use in shielding from dynamic, self perpetuating energies or radio freuencies (RF) include aluminium foil and wire mesh. These two are readily available, usually from the nearest retail outlets. They are easy to put together but require hard work to ensure they are safe. This is because they are easily perforated by heavy attacks. One has to constantly check for holes and, in the case of wire mesh, rusting that takes from the shieding potential. When used in a faraday cage construction, they are only good in layers. I have found that upwards of 2 (two) layers of wire mesh offers sufficient protection, while 6 (six) or more is good enough with aluminium foil. More layers are required when the shield is partial, ie. shielding an angle of attack only. The number of layers should also vary depending on whether the shield is active or passive. Active shields are shields that are electrified, for example. 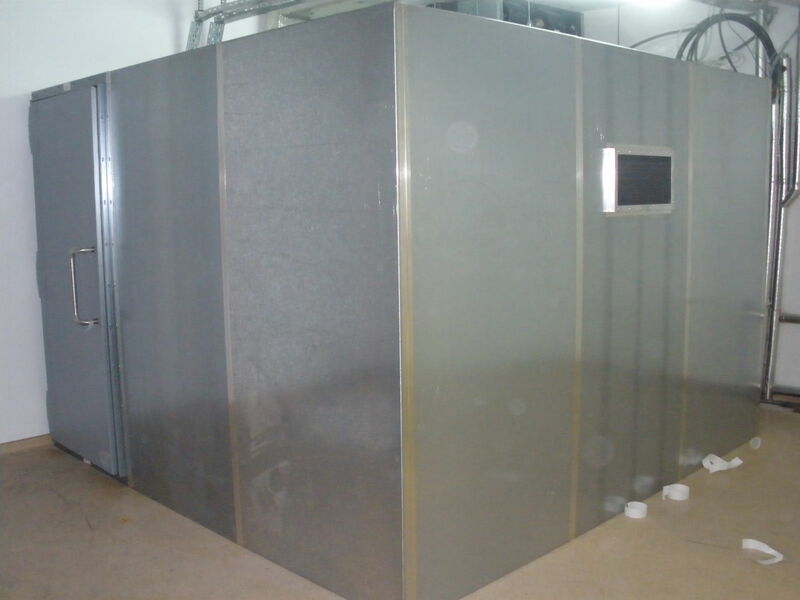 Sheet metal is the better option in all types of shielding. The thicker the metal is, the better the protection provided. It is a good idea to combine types of metal. A layer of aluminium over a layer of lead provides better protection than a layer of lead alone. Try not to leave it at layering alone where metal pieces overlap. Folding is the better option. If you have no choice, then lengthen the overlap. Above 4 centimeters is good enough. Ensure that the sides of the metals are touching throughout. All static structures you make should be grounded, and there should not be any loose metals on or close to them. When perps realise direct attacks are foiled, they usually go for indirect attacks that will include creating hotspots by bombarding metals in the vicinity. Be aware that not all sensations you will feel in a cage or behind a partial shield indicate a breach of the shield. Your perps could just be heating the air around you, or chilling it, using various other frequencies that achieve the result, or they might have switched to ultrasonics if there is no shielding against sound energies. If you are not sure your grounding is safe from tampering, then try to find a metal weight to use as an alternative. A fully laden barbell or a lighter dumbell with the weights firmly attached will do the job to some extent. The heavier the metal, the more the sum of the electric charge it will take away from the load on the shield. 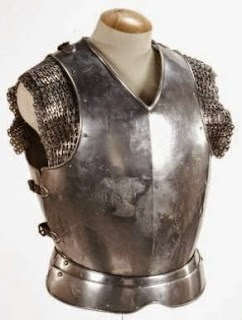 The armour in the picture above resembles that which I wear when I get out of a faraday cage. The difference is that mine opens from the front and does not have the shoulder extensions. It is designed to fit the shape of my torso. When expertly made, this shield can be worn over a long sleaved vest and under a shirt. People will not be able to tell you are wearing it. Unless you are prepared to carry a weight around to ground it to, the shield works well without grounding. Conventional wisdom has it that it is not safe to move around with an ungrounded shield against RF, especially when experiencing V2K assaults because the metal then acts as an antennae. What those who say this do not realize is that (a) you are moving about and it is not easy isolating any part of your body and (b) the attenuating effect of sheet metal on RF means direct, strait lines of fire into your system are either lessened or thwarted in effect. What you get most of are dynamic frequencies turned into static frequencies, meaning you have shifting hotspots around the shield that cannot have as damaging an effect as linear attacks to major organs. Speaking with authority over the use of such ungrounded shields over the head and around the torso, I can certify that they work, very well at that. They even give protection when you are merely sitting in one place. I know this because things get worse when I do without them. Causing me to have a running stomach or vormit after a meal was how perps/operatives attempted to destroy my health. All this became a thing of the past when I took to permanently wearing such shields. Whats more is the fact I no longer suffer from malaria (not at all) since I started the habit. My bike rides were an anticipated event because of the exercise involved and the mobility. I always got such brutal RF and ultrasonic attacks I would usually be enervated after a short distance, and very sore as well. I almost gave the sport up but that is no longer the feeling. The attack issues have now largely been dealt with since I started wearing shields like this. I noticed that my energy levels rose when the shield went as low down the torso as limb movement allowed. This pointed to the fact attacks were mostly aimed at my guts, preventing them from functioning properly, rendering them incapable of meeting the energy supply needs of a body engaged in strenuous activity. The choice here really is between better or worse. For me, preventing directed energies from cutting into my body and causing all kinds of conditions is preferable to preventing V2K. The one thing you need to ensure where ungrounded shields are concerned is that they are thick. Should you make them using aluminium foil, then use a minimum of thirty layers. Shielding against ultrsonics is easier than shielding against RF. But here also there are some facts you need to know to get it right and safe. As is the case with shields against RF, the thickness of the rubber matters. Thinner sheets offer less protection. The best design should be six sided because ultrasonics tend to behave like microwaves around shields. It should in fact be like a faraday cage. If you cannot put rubber on especially the floor, then do not sleep on or near it, unless you have no choice. Placing a foam matrass on the ground will not be a good idea. The unhealthy vibrations from the sound carefully aimed to get around the upper shields will get through. Sleep on a raised surface, such as a bed of course. If you design a rubber shield to put around your torso or hat to combine with the conducting shield, then place the rubber on top of the metal, and, better yet, isolate the two with a non-conducting layer. Perps can launch attacks on the metal that then creates intense heat on the rubber that in turn releases fumes that will cause odors or negatively affect you when inhaled. Once you have these shields up, you will be safe enough from the worst that directed energies can cause. You could leave it at that, or increase security by placing shields that deal with exotic energies. Knowing your body is made up mostly of water, the directed energy that manages to pass these shields and affects you within can be dealt with by a shield made up of water. These energies will then get caught in this water and not reach you within. Rather than placing around you jugs of water, or sprinkling your walls with water and have to deal with the dripping, you can purchase large plastic bags open on one side like bin-bags. Wet some foam, wrinse it thoroughly or hang it so that the water drains from it, leaving it moist but not dry. Stuff it in the plastic and seal so there is no evaporation. Place the plastic filled with the moist foam where shielding is needed. Out here on the farm, I sometimes fill plastic bags with treated grass. You can actually use any material that is readily available to you for this, provided it absorbs water. The preferable thing to do is use extra large bags and shape them flat, then build your house of whatever it is you filled the plastic with. The solutions offered here, the body armour in particular, may seem crude but, apart from shields designed for the attack intensities that equal those a target of covert warfare will be exposed to, such as shields made by NASA or those worn by mobile phone transmitter installers and repair men, most shields on offer online or otherwise are only good enough for the EMF noise that a significant number of world populations are exposed to on a daily basis. These shields will help with odors and other effects of this EMF noise, but will be of no use against much of what perps use to harm their targets. Damn thank you! I just found out about your book and i think i'm gonna buy it. I hope you all the best.